On August 24, 1814, Washington, D.C. was invaded. British soldiers led by Rear Admiral George Cockburn marched methodically from site to site, setting fire to government buildings. Follow the path of the British during a walking tour that brings to life the incredible story of the nation’s capital and its brave citizens. We set the stage in the vicinity of the U.S. Capitol, where an inferno would soon rage that could be seen as far away as Georgetown. 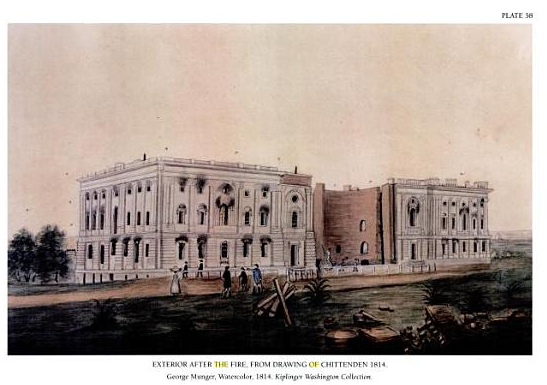 Although the British leadership vowed to spare private property, one Capitol Hill residence was destroyed. Why—and by what means? See where a brick building was quickly constructed to enable Congress to convene once the enemy had gone. At the Canadian Embassy participants will hear why this northern neighbor was key to both the American and British military strategies. (Did you know that U.S. troops burned its capital city?) A practically hidden plaque on a Pennsylvania Avenue building reminds passersby that the offices of the influential National Intelligencer newspaper once occupied the site. So strong was Rear Admiral George Cockburn’s antipathy for its editor Joseph Gales that he sought to damage both the paper and the man. Saturday, August 24, 2019 at 11:00 a.m.
$20 per person with ages 3 and younger free. $5 discount with federal or military ID. Walk departs from Capital South metro station.